When it comes to building your pool, the most important decision—after deciding to build—is the shape of your pool. Is a classic geometric pool the right addition for your spacious lawn? Or is your oblong lot better suited for a freeform spa? Available space is certainly a factor, but what other things should you consider when deciding on the right shape for your Baton Rouge pool? Why are you building a pool in Louisiana? Are you looking for a private lap swimming pool or a relaxation lagoon? With a little creativity, any shape pool can be suitable for a little aquatic exercise, but long, rectangular pools are the most conducive for swimming laps or water-walking. If you’re bored of the traditional rectangle, but still want to incorporate those classic, clean lines, consider the Grecian or Roman style pool shapes. Looking to relax? A freeform or geometric pool uniquely nestled among lush greenery and babbling water features is a masterpiece of ambience in every season. Who will be using your pool? Take a moment and envision your dream pool. Is it an intimate oasis for two? Or a lively gathering spot for loved ones of all ages? If you’re sharing your pool with less confident swimmers, you may want to consider building a pool with more definite boundaries between the shallow and deep ends. Freeform pools—such as the always popular kidney-shaped pool or the modified figure-8—provide an obvious, yet attractive separation between the shallow and deeper areas. As for family-friendly geometric pools, oval and L-shaped pools provide space for safe diving and a simultaneous shallow-end water volleyball or basketball tournament! More of a spectator? You could enjoy the water and the game while sitting on a custom concrete in-pool stool. How do you want your Baton Rouge pool to look? 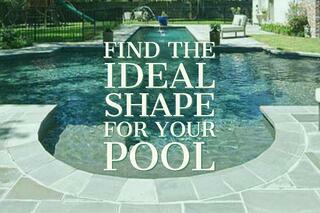 When deciding on your pool’s shape, it’s important to consider why and by whom it will be used. But the most important factor is how you want it to look. A custom concrete inground pool could be the centerpiece of your backyard for years to come. So, before jumping onboard the freeform pool train or diving into a more traditional geometric pool, consult with the pool building and design professionals at Lucas Firmin Pools. With over 15 years of experience in pool construction, Lucas and his team have seen it all and here to help you shape the pool of your dreams.